Do you need the right tool for capturing contact information from your leads at trade shows and other offline events? Trade shows and other events are a great way increase brand awareness and attract new business opportunities, but you need to be equipped with the right tool to attract potential business to your booth. 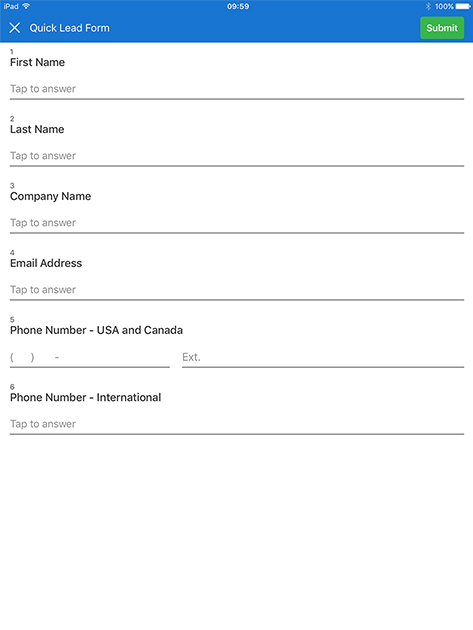 Throw away that pen and paper and start creating beautiful and usable quick lead forms with our survey and form creation app! In minutes you'll be up and running with your own lead form survey. Collecting contact information from prospective leads just got faster and easier! Say goodbye to pen and paper, and hello to QuickTapSurvey, the #1 survey app. Customized surveys like this one are fun and easy to create, and you can choose from a variety of great lead capture templates that are usable with either a phone and tablet (we support Android and iOs devices). You can even brand your quick lead form with your logo and colours to match your other marketing materials. Best of all, lead form responses can be collected in person on any mobile device or remotely with a kiosk and you don't need to have an internet connection to successfully gather data with our app! When you're done gathering leads with your fast lead survey you can see the results from respondents in real-time, export your results in multiple file formats and generate beautiful and shareable reports on your lead form data. Whether you need a quick lead form for trade shows, events, conferences or seminars, QuickTapSurvey has you covered with our easy to build, easy to use offline solution. Try building your own lead form today and find out why we're the number one rated survey solution.